Engineered to deliver the performance attributes most requested by on - and off-track dirt bike riders, including consistent clutch feel. Consistent clutch feel is the result of 'friction durability', so whether deep into a race or deep in the woods, riders can feel confident that their clutch will perform from start to finish. AMSOIL exclusive advanced chemistry provides outstanding engine reliability for worry-free operation under severe conditions. 10W-40 Synthetic Dirt Bike Oil: recommended for Honda®, Yamaha®, Kawasaki®, Suzuki®, Husqvarna® and other dirt bikes where 10W-40 motorcycle oil is used. Recommended for separate-sump applications such as Honda CRF, and many two-stroke dirt bikes. AMSOIL Synthetic Dirt Bike Oil's superior friction-durability properties help minimize clutch slippage, fade and chatter, giving riders consistent clutch feel during takeoffs or when maneuvering around obstacles on the trail. In an extreme simulated-start test, AMSOIL Synthetic Dirt Bike Oil continued to deliver consistent clutch feel following 32 simulated race starts, while a leading original equipment manufacturer (OEM)-branded oil demonstrated inconsistent clutch-lever action and poor clutch feel after 16 starts. The clutch plates lubricated with AMSOIL Synthetic Dirt Bike Oil remained clean and in good overall condition, while the plates using the OEM oil revealed discoloration and wear. AMSOIL Synthetic Dirt Bike Oil's superior performance helps instill in riders the confidence that their bikes will perform consistently in all types of riding conditions. AMSOIL Synthetic Dirt Bike Oil withstands high-rpm operation, extreme heat and mechanical shear. Its synthetic base oils naturally resist viscosity loss and provide a protective film against wear to gears, bearings and pistons. Its anti-wear additives provide an extra measure of protection, promoting long component life to help riders get the most out of their bikes. AMSOIL Synthetic Dirt Bike Oil underwent extensive on-track testing in the bikes of AMSOIL-sponsored professional riders on the GEICO/AMSOIL/Honda Factory Connection and Team Babbitt's racing teams. A combination of racer feedback and lab testing allowed AMSOIL to fine-tune AMSOIL Synthetic Dirt Bike Oil for outstanding wear protection and consistent clutch feel - benefits riders demand. 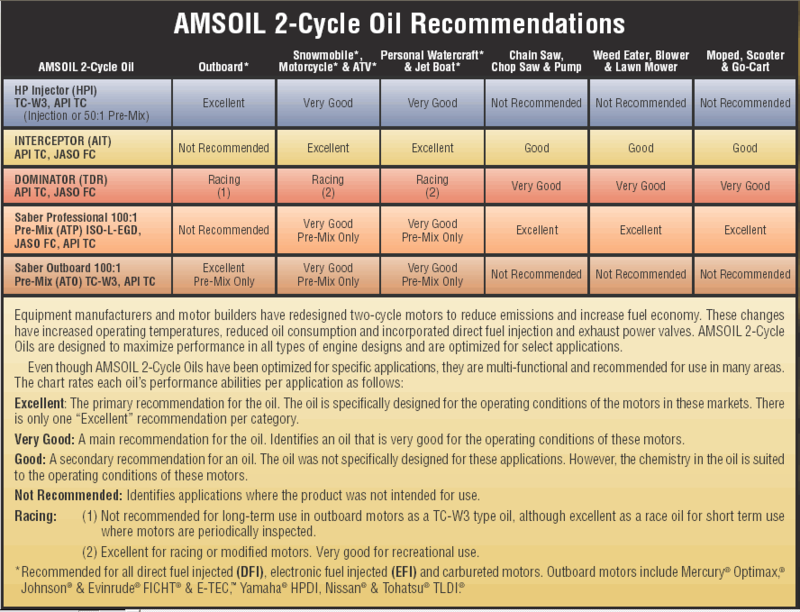 AMSOIL Synthetic Dirt Bike Oil should be changed according to the vehicle manufacturer's recommendations. 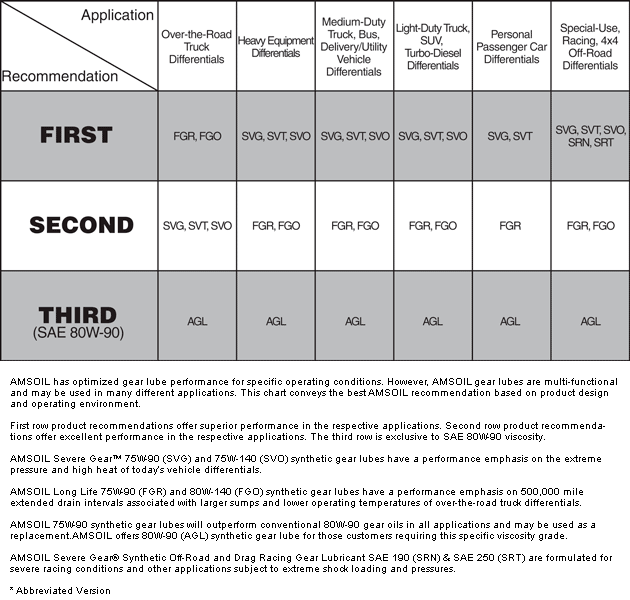 Click here to view the MSDS Data Sheet for AMSOIL DB40. Votes & Reviews: 54 vote(s) and 50 user reviews. I currently own 4 dirt bikes and a quad and they all use Amsoil now. I've also rebuilt several bikes/quads that I've sold over the years. I've tested most of the major brands and Amsoil shifts so much better than most of the leading motorcycle specific brands! 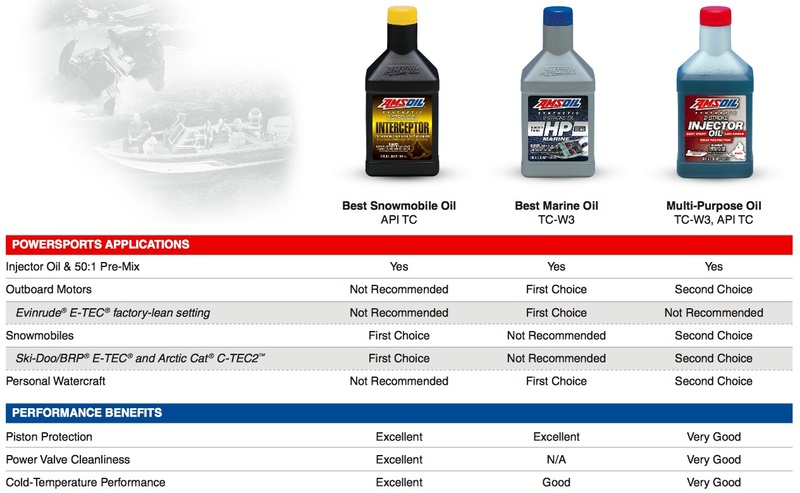 Amsoil is now my #1 with Max... being #2. Seems to work great and good clutch feel. Great price compared to dealer oil prices. I have always used Amsoil in my sons Dirt bikes and we have never had the problems others have like bearings going out or rings seizing up.I do all of our mechanic work and motors using Amsoil don't show wear like other oils.Don't compromise protection use Amsoil. Use this in my 2017 Benelli TNT 600. Makes it run like a champ!! I use this oil to keep 3 different enduros running strong. Amsoil has never let me down. Unlike other oils, Amsoil has never smelt burnt or looked broken down after any of our long desert races. Use in my son's KX250F dirt bike. Noticeable power increase, clutch feel, smoother running and holds up longer than other oils between changes. When your race counts on superior engine performance there is none better than Amsoil to give you the confidence in your motor. This oil runs awesome in my son's kx100. I use it in my 2011 KLR650. My bike shifts better since I switched to AMSOIL and performance is much better overall. I switched from the traditional Amsoil Motorcycle oil to the Dirt bike specific formula when it came out a few years back. The claims about improved clutch feel were not exaggerated. Considerably better clutch feel in my old YZ250F. Smoother engagement and a better slip zone. I use this in my BMW adventure bike which sees hard use of the clutch in off highway riding to work through tough terrain. Love Amsoil products. Something I can count on always working even when racing is unpredictable. Great product! Use on 4 strokes off road bikes that I service! Great protection, quality & consistency! Use this product in two dirt bikes my son and I ride and race. Will use nothing else but Amsoil! Great product that does everything they say. The only oil I run in my dirt bikes. I don't have to rebuild my engines as often due to the quality of Amsoil. Which saves me money in the long run. Ive used amsoil since the 70s and I fill its the best product on the market. I mix it 83 to 1 with aviation fuel and its the best,no build of carbon at all!!!!! I've used this for years in Harley's and saw the difference in dyno numbers first hand as a Master Technician. Now I'm racing dirt bikes again in the GNCC Series and see the difference in engine wear and clutch performance. I would buy this oil even if I were offered other oil for free! This made the clutch in my Gas Gas TXT 280 Trials bike operate with better control. Use this oil in dirt/racing bikes. Have been using this oil for the last 5 years in all of our bikes. This product helps the performance of the bikes and would use no other. I use in my dirt bike, excellent!! I will only run Amsoil in my dirt bike. I change the oil in my 4 stroke 250cc engine every 8 hours. I have over 250 hard woods hours on that engine....and it is still going strong!!! I will buy this product every time. I use it in my honda 450x and the clutch feel is real.Amsoil said it helps your clutch and they aren't lying. I will continue to buy Amsoil for my machines. Amsoil dirt is exceptional in my Honda. Clutch works great and my motor stays clean!! Repeat on buying this oil!! Grandson races his bike. And this oil seems to help and last longer!! Product allows us to run more hours on our KTM's before engine overhaul. Great product! I have a lot of engines in different kinds of equipment and vehicles. I use Amsoil in everyone of them except my airplanes. Have been using Amsoil for over 30 years. If I live long enough I will use it 30 more. Great oil and great customer service. I use this in all of our dirt bikes and atv's. Nothing but smooth running, shifting. The best. I dont need to say anything. I am an Amsoil for life customer. Enough said! I use this in my 2015 crf450 in both case sides. Works great in the engine and on the clutch side. This is by far the best oil i have ever ran in my bike. I have ran synthetic mobil 1 before this and the bike just didnt run as good when i put mobil 1 in there. Amsoil changed that. Thank you Amsoil! I've been riding,racing and maintaining dirt bikes and other motorcycles for over 40 years I have been using Amsoil in all my trucks and motorcycles for around ten years. I have never had a engine failure since moving to Amsoil from Pensoil I have a 2015 Suzuki rmz 250 that I trail ride and my son rides motocross on. I change the oil and filter every 6 hrs per manufacturer recommendations. No problems at all. I use this in the kids dirt bikes and side by side. The performance has been enhanced tremendously. Great product. Oil still looks good after 2-3 times longer change intervals in my KTM. Used in my son's KX 85. Great product with maximum protection while delivering incredible performance. Definitely will continue to use Amsoil products. Since changing to Amsoil my 2016 KLR 650 idles, runs quieter and much more smooth. It shifts more precisely and smoother. I noticed the idle RPM increased slightly. I am very pleased with the results. We run this product in our dirt bikes and have had nothing but Great results!! As always Amsoil Rocks!! I use this in my 2009 WR450F it is a great oil.